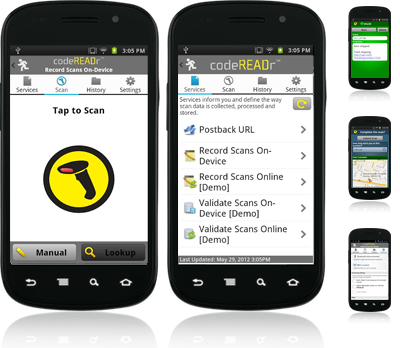 An update for codeREADr’s barcode scanner app for Android was just released on the Android Market. This is a big release that not only fixes bugs and increases speeds, but also introduces some new features. Faster and More Accurate – the barcode scanning engine will make event ticketing, coupon redemption, attendance management and more much more efficient and easy. Search Database – click search to find keywords or letter combinations in your downloaded databases. New Archive Tab – scroll through all of your scan history, wether it be on the device or in the cloud. New UI Improvement – Making our app nicer and nicer to look at. Duplicate Settings – you can now set wether or not to mark duplicate codes valid or invalid right on your phone through the Settings tab. Remember to check it out HERE! and if it’s your first time with codeREADr, don’t forget to sign in to codeREADr.com to get the most out of your app! Add auto refresh to the new “Archive” tab when switching between selected tabs. Make the prev/next row for searching function as transparent when not needed so that we increase the amount of screen real estate available when view search results. The new default free orientation implementation is working on older Android versions. Added the ability to clear an existing search. Add the fast scrolling to the search view that automatically shows a big slider that the user can drag when the results are more than just a few. Changed from using real images to simulated images created by xml code for many views. Also created a styles01.xml file for controlling the color scheme and application updates much faster.